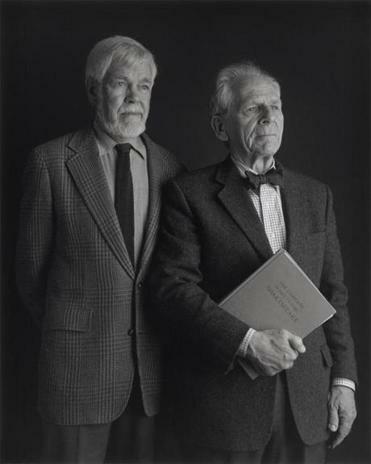 Portrait of William Burto and Sylvan Barnet, 2003; by artist Sugimoto Hiroshi. A son of a leather tanner in Brooklyn, N.Y., Sylvan Barnet found his way into the world of literature through graduate studies at Harvard and spent his entire career at Tufts University, twice chairing the English department. A mentor to students, colleagues, and friends, he extended his teaching reach throughout the world as the general editor of the Signet Classic Shakespeare series of inexpensive paperbacks, by writing and editing widely-used college textbooks, and through serving as an editor and author of the “Short Guide to Writing” series – each slender book focusing on how to write essays on subjects ranging from biology and chemistry to art and music. For students he taught during 30 years at Tufts, however, Dr. Barnet was a memorable figure at the front of the classroom. A noted collector of Japanese art, Dr. Barnet died of brain cancer Jan. 9 in his Cambridge home. He was 89 and had remained involved in various projects until the end, which as far as Dr. Barnet was concerned could have arrived sooner. He was bereft when his life partner, William Burto, a former longtime English professor at Lowell State College and the University of Lowell, died in 2013 of multiple myeloma at 92. Industrious and productive, Dr. Barnet often was at his desk by 8 in the morning and worked until midnight. Such discipline might suggest he was a humorless grind. The opposite was true. As a guiding literary light, Dr. Barnet offered direction to more than just his students. As an author Dr. Barnet “wrote gently,” Gittleman recalled in the interview. “Nobody had any trouble reading what Sylvan wrote.” And in an official or unofficial capacity, he shared that writing talent with others. Born in Brooklyn on Dec. 11, 1926, Sylvan Saul Barnet was a son of Philip and Esther Barnet. Dr. Barnet left much of his estate to a Tufts scholarship fund in honor of his parents. He had dedicated “A Short Guide to Writing about Art,” whose 11th edition he completed in his final months, to the memory of his brother, Howard. After graduating from high school, Dr. Barnet served in the Army at the end of World War II, and then went to New York University, graduating in 1948. Moving to Harvard – it was “a chance to keep on reading,” he told the Globe a year ago – he wrote a prize-winning essay on Shakespeare and received a doctorate in English in 1954. “They were just a wonderful, wonderful couple,” said Stubbs, who considered Dr. Barnet her closest friend. Burto, Dr. Barnet, and their friend Morton Berman, who taught at Boston University, rose to lead the English departments at their respective colleges. They collaborated on books and reviewed faculty applicants together. In 1963, little more than a decade after becoming life partners, Burto and Dr. Barnet bought a Korean bowl in New York City, and they soon switched their artistic interests from Korean to Japanese ceramics and Zen calligraphy. They collected scores of works and, upon each of their deaths, bequeathed their collections to the Museum of Fine Arts in Boston, the Harvard Art Museums, the Metropolitan Museum of Art in New York, and the Freer Gallery of Art in Washington, D.C. “We are trying to help people have the experience we had,” Dr. Barnet said in the Globe interview. Of his collecting choices, which he often made by instinct, Dr. Barnet recalled last year that different artworks “hit you in a magical way.” His holdings with Burto, meanwhile, were funded largely through the many books they wrote and edited over the years. “Textbook writing can be quite remunerative,” Dr. Barnet said. “A Short Guide to Writing about Art” includes numerous short chapters on a range of areas, from “the writer’s audience as a collaborator” to the impact of social history on the reception of art. Dr. Barnet left no immediate survivors. At his request, no service is planned. He prepared his own obituary and, writing about himself in the third person, recounted his anguish at the death of Burto. In Burto’s absence, Dr. Barnet wrote, he regretted each day his “inability to re-enact” those lines.